Stryker thanks for all that you do. Since you have started this Dinar Site we have become friends for Life. With us both being Car guys we will have lot more good times dealing and racing cars in the years to come. I thank you for all the lunches that you and I have had and more especially the Dinner dates that My wife and I have had with you and Mrs Stryker. We talk about them all the time. We really enjoy being out with you guys. I know we will have many more as we just talked this morning and have another already in the making. If the dinar does not do anything my wife and I have for sure have made some millionaire FRIENDS. God Bless You and Lady Stryker. Just to let you know, I'm ready.------GETTER DONE!!! I LOVE FLASHBACKS - PAST PROVES FUTURE - FACTS NOT FICTION - EYES ON TARGET! If you have ever run a group (softball team, community groups, etc), you know there are a lot of people happy to offer more than enough 'suggestions' on how to fix what they believe is wrong with the plan....but they will never take on the responsibility to actually do the work needed and put together all the parts and pieces, make the phone calls, etc....WELL, STRYKER AND ALL OF THOSE THAT GATHER THE VARIOUS PIECES OF NEWS AND EVEN THE RUMORS....THEY ARE DOING THE WORK. I know (just from reading the notes posted here over the years), the work done by so few for the benefit of so many is GREATLY APPRECIATED!!! Thank you all for your efforts and the very beneficial information you have provided for so long. I like the shirt. We need to sell these things. A Proud Member Of The STRYKE Force. If amhvl quits his job then I can quit mine! And thats my " Man Plan "
I agree, this team is wonderful and I hope that this relationship can go on for many years to come as former Dinarians and future friends. Thank you very much. ISX member since April 2016!! that I can remember. 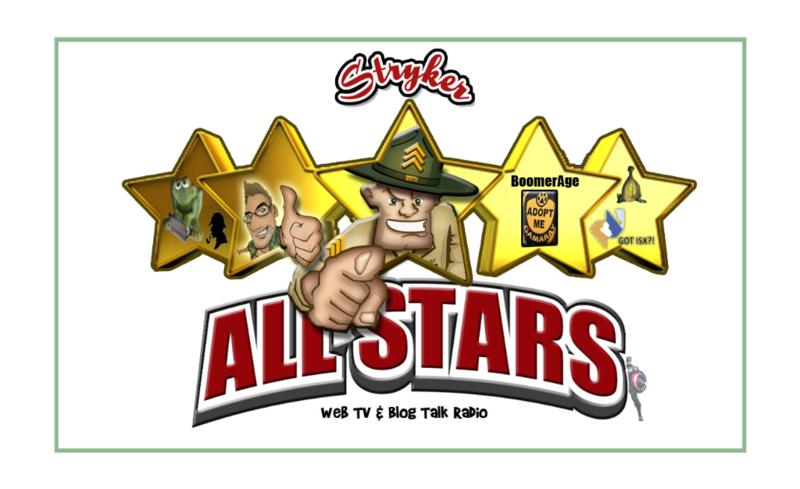 Stryker , you are the best , and all the news hounds , from Stveveoooooo, (got carried away ) , Timesup , Wild man Jasa , Gammaray , etc are just FABULOUS ! I really enjoy what you do , and how much of yourselves obviously is put into what you report. Thank you , and just know we all appreciate it and enjoy it. I work a lot of news sites and it isn't easy or fast. Your dedication is unreal. Go RV ! GOD has brought all of you into our lives and we cannot begin to appreciate all of the behind the scenes work that you do that brings us the daily news. May GOD continue to bless all of you and your families. I'm grateful every day for having a reliable place to mine information and hear news, ideas and opinions from respected sources. It allows me to reach my own conclusions without all the noise and distractions of overblown egos spewing their nonsense. So, thank you Stryker and your family and your entire team for the endless hours bringing this to us and thank you jasa1 for providing this convenient opportunity for people to say what they're always thinking, "What a great site! Thanks." And thanks for being the real deal, Stryker. Rare breed. Rare indeed. I just love Stryker for his mind!!!!! The best/ only Dinar site on the world as far as I'm concerned. Thanks to Stryker and his wife and children for all you do and give to make this site happen. Mrs Stryker, being a wife myself, I know that you have given more than most even think of. 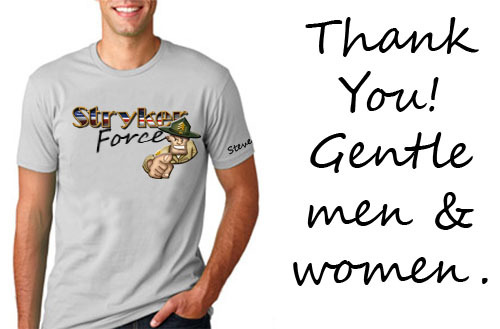 So thanks for your patience, and your backing of the man we all call Stryker. I know that it is you that have encouraged, praised and given strength when the tough times have come. So truly thank you. Blessings to all those that work so diligently to make this a place of truth and peace for now and for our futures. Ok, my turn. I have been involved in this endeavor a very long time. I have been a Mod on 3 sites and only got banned from one of them, lol. I have known many people involved in this. Some still are, some have faded away, some have even gone to ( as I call it ), the DARK SIDE. Unfortunately several have even been called to their eternal home before they could see the end of the ride. I miss those greatly and will forever be indebted to them for the things they shared, and the many things I learned from them. That being said, let me tell you; Of all the places I have been in Dinarland, I never really found a home until I found StrykerBlog. Stryker, you have become so much more than just my friend. Your more like a brother to me. You give so much and ask for so little. Without your phone calls, texts and just your knowledge in general, I would most likely be lost in the abyss of it all. To Lisa, Chase, and the rest of your family, I want to thank you from the bottom of my heart for sharing your Husband and Father with all of us. The information we receive here is unparalleled in the Dinar community. Pure, factual information that can be found no where else but here. It is my distinct honor to be a part of the news team, and to have been asked to be one of the Co-Administrators of the best site on the web especially when I realize that my contributions here pale in comparison to so many others. Gamaray, what can I say? You are the best in the biz. It is an honor to call you my friend. Timesup; Girl, I have known a lot of people who bring the news, but you....WOW! The absolute best! My dear friend Entropy, your articles are fantastic, but your friendship is even better. Our late night chats and phone calls mean more to me than I could ever express. SteveOOO, you came here a bit later, but did so with a vengeance! I appreciate all you do. jasa1, I love your passion, your spirit, and your willingness to help in any way you can! ( I expect those ribs to be extra meaty by the way). paythatman...Dude, where do you even find all that stuff? Absolutely amazing job. th37, best sound checks I've ever seen, lol. Along with all the other things you do. To all the other newshounds and Moderators, please forgive me for not calling you by name, it's just that your numbers are so large, it would take several pages to name you all. Thanks for helping me to expand my knowledge as we continue on the journey. I so look forward to the day when I get to meet each and every one of you in person. If you don't like hugs, or handshakes, you best steer clear of me, cause I got a million of them! Last, but most certainly not least...Our Members. You are the absolutely most awesome group of people I have ever seen! Just the fact that you are all here seeking truth, and not the everyday Guru crap proves that you are indeed the smartest dinarians on the planet, and I appreciate you all so much! jasa, thank you my brother for starting this thread. It is long over due. If you all took the time to read this long post of mine....well, all I can say is you have way to much time on your hands, lol. Thank you all! Real facts, with real people, about a real investment.....called the Iraqi Dinar. Thanks to Steveooo, Timesup, RSS and the rest of the mods, members and hangers-on that kept us focused. We're near the end of the journey but the friendships will last forever. Im a little short on words but my appreciation is great for you all. Thank you! Thank you to all we appreciate all your daily.....and sometimes middle of the night....efforts to bring the truth and facts to us dinar holders. I have only made a small investment. ...with as Stryker says taking nothing away from my family......but as even a small investment has been made i appreciate the facts being presented by such a professional and responsible team.